Killer Characters: Five things you should know about me! Plus a reader giveaway! Five things you should know about me! Plus a reader giveaway! Hello readers! Cora Chevalier here. I'm a character in a new series—Cora Crafts Mysteries. I figured it's about time to introduce myself. I came up with five things about me you might like to know—but I'll be blogging here from now on, so we'll have plenty of time to get to know one another. 1. I grew up in Pittsburgh, became a social worker there, where I counseled women in a shelter. My work became my life—until I developed a severe anxiety issue and I realized I need to make a change. 2. One of the things that helped some of the women I worked with was crafting. Whether it was scrapbooking, knitting, pottery, or whatever. Somewhere along the line, I realized it helped me, too. But not enough. I started writing about my crafting on a blog called Cora Crafts a Life. 3. Strangely enough, my blog took off and soon I was making more money as a blogger than as a counselor. My dreams began to shift to finding a a place for a craft retreat, where my online community could gather and maybe even expand. 4. My best friend Jane and I began to plot how to make this dream a reality. soon enough, we were searching for houses to fit our needs. You can read about that adventure here. 5. Now that we are settled in Indigo Gap, North Carolina, we are so busy planning for our first craft retreat that we've barely had time to enjoy our new home—Kildare House, a sprawling Victorian mansion. I live in the attic apartment with my cat Luna. Jane lives in the carriage house with her daughter London. Ruby O'Malley lives in the gardener's cottage on the property—she was grandfathered in with the sale. It's turned out very well—she's a gifted herbalist and fits right in with our craft retreat plans. 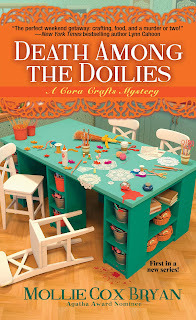 Please comment for a chance to win one of three advanced copies of DEATH AMONG THE DOILIES (A CORA CRAFTS MYSTERY) out on August 29! Do you like to craft? What's your favorite? Can't wait until this book comes out! I divide my crafting time between cross stitching, quilting and knitting. It's great to start with the first, isn't it? Thanks for a chance to win a copy of Death Among The Doilies. Sounds like a book I would enjoy. Hi there, I have not read this series, but it looks really great. Yes I craft, knitting mostly and some embroidery. It's a brand new series. Starts in August! I haven't done any crafting for years but used to crochet, embroider, sew etc. Your new series sounds terrific! I do like to craft. I am scrapbooker and card maker. I also used to love doing latch hooks back in the day. Thank you for the chance to win. Making a money as a blogger? Sign me up! :-) I love to cross stitch. It is very relaxing. frybbe (@) gmail dot com. I know, right? But there are some bloggers who do very well. Sigh. I haven't done any crafting since my four children were little. These days I have a special cabinet in my 2nd room library with all sorts of things for my 12 grandchildren to play with and do "projects". I do enjoy reading crafter based cozies and look forward to reading this one. My crafting comes and goes. I can knit, crochet, and embroider. Not much of a crafter myself, but this book sounds good. Knitting and spinning... thank you! Right--absolutely nothing can go wrong. Ha! I'm not much of a crafter---more of a reader. The title of this book brings back memories of my grandmother's house and all her doilies. My great-grandmother MADE doilies! LOL! This is my type of book!!! I love knitting, painting, drawing, latch hookinging, and several diy prjects. Thanks for the chance to win!!!! I love to read crafting mysteries. crafting as part of the story. Sounds great. I like to crochet and quill. I love crafts and mysteries. This new series sounds like a great combination. I can't wait to start this series! Love the covers! I really enjoyed getting to know Cora. I'm really looking forward to reading this new series. Love crafting mysteries. I can't wait to read it - and I love to scrapbook and make cards! The only crafting I do is coloring with my grandson. :) I'd love to read this! It sounds like a book I would enjoy! Thank you! I used to like to do beading but anymore I paint watercolors. A craft retreat sounds spectacular! I like stamping and scrapbooking! I love to read stories with crafts in them, and I love to look at pictures of craft projects and I love to buy handcrafted things. Make them myself, not too crafty there! Thanks for the giveaway and introducing me to a new series. How awesome to meet you Cora! I scrapbooked for years but am a perfectionist and got frustrated. My talents are more suited to repainting dolls; restoring and refreshing the older ones is my fav! Nothing like the smell of paint, new composition compound and sealer to get me working. I like your introduction and I look forward to getting to know your characters! Knitting is my favorite, but I crochet & embroider too. Yes, I craft ... I love to knit and crochet. WOW, This sounds like a fun new series. I would love to win an advanced copy. I used to do a lot of crafting but not so much now. She should never have said, nothing will go wrong. I'd love to win this book, sounds fun. I make cards alot right now. Love it. Oh this sounds like a fun read. I am a crafter from way back .... I taught myself how to do counted cross stitch. I have designed a few patterns,won 1st and 2nd place ribbons for some of my work. I was totally addicted to it. I did it before work while sitting in my car,at lunch and after I settled in after work. I did this for many years but ,,,,I got hurt at work and had to have shoulder surgery. After I was fully healed, I lost all interest in it!!! After some research,I realized it was from the surgery and going under the anesthesia ! Now I do painting ceramics and make plastic canvas doll furniture. I am making 2 sets of table and chairs and Barbie beds with bedding for 2 children's hospitals... and I love to read..thanks for the chance. Crafting was always a cathartic activity helping to push aside the worries of work and life outside for just a while. It was also a wonderful, personal way to celebrate holidays. I loved making unique picture frames, memory quilts, needlepoint pillows, and stash boxes. I also brought crafting into my classroom. Students made macrame key chains, candles, candlesticks, pencil boxes, clay bowls, and we even tried a jewelry project. I always found even the "wiggles" would find a moment of peace...or maybe I'm the one that found the peace! My favorite crafts to make with my children are greeting cards and decorations. We bring joy to others and we have a bond tighter than tacky glue could ever have. Your book sounds great! Thank you for having a great contest! Good luck with your retreats. I enjoy doing hook rugs. cheetahthecat1986ATgmailDOTcom. A craft mystery series-awesome. I do quilting and doll making. A craft mystery series - awesome. I do quilting and doll making. This series is awesome! I too, used to do latch hook crafts back in the late 70's...I still have a design that hung in our first house that I can't make myself throw away. I also enjoy cross stitch, and making things with plastic canvas. Crafting is my way of recharging myself at the end of a busy week. Thank you for the chance to win a book! I love painting ceramics and wood items. thank you for the chance. I used to knit and crochet. Haven't done that is while. I like needlepoint and scrapbooking.